Replace manual processes and spreadsheets with electronic data that’s searchable, reportable and up-to-date to ensure assignments and future obligations are met by their deadline. Whether you need to track internal/external requests, generate reporting, or maintain a record of correspondence, you need to know who has the item, what happened, where the documents are, and information to complete the project. DocMinder® ensures consistentency with repeatable workflow processes that transform the way you view and manage day-to-day activities. Explore DocMinder® solutions for Corporate Legal and Law Firms. A requestor fills out a dynamic web-form that populates further questions based on the responses given. Any supporting documents can be uploaded and filed into iManage automatically. Once the request is submitted an automatic project assignment notification is generated and sent via email to the correct individuals based on their responses provided. Legal requests can appear in reporting as an unassigned-project which a supervisor can then assign. Request assignments provide automatic follow-up through-to completion. Progress information and calendar views allow you to track deadlines and view workload by department. Assigning work related to the documents within iManage. Automatic email follow-up till closure and Reports and Calendars for progress oversight. It starts with a legal subject matter expert opening their dashboard to see the legal forms due for review that are assigned to them. They also have a search engine to identify legal forms requiring review because of recent changes in the laws, etc. There is a summary page per form containing relevant metadata, questionnaire to help establish future review frequency, workflow status if more than one review is involved and a timeline of all comments. Once approved the form is redistributed to all relevant parties to use going forward. Management has robust reporting options for compliance purposes. Automatic email notification also available. Business process templates create automatic email reminders which provides you with consistency for managing the document approval process. However, when flexibility is needed the delegation ability allows for ad-hoc changes, while all activity is being tracked by DocMinder® reporting. Process to track Client’s approval to release their documents to third-parties. Legal Matters are now easily managed throughout their life. It starts with a customized new matter intake form that routes and manages the assignment including related documents. Robust management tools such as reporting, calendars and dashboards that provide team oversight. Route invoices (e.g., Invoice from Outside Counsel) to the correct individual(s) for review, changes and final approval for payment; optional checklist or workflow. DocMinder® notifies the responsible parties of a pending legal matter, including all relevant matters and locations of physical or digital documents. 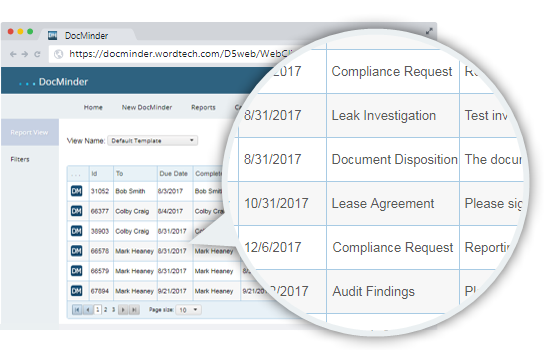 DocMinder® Records Disposition Workflow Processing provides automatic document distribution to responsible parties upon retention dates. The appropriate parties receive an email and link to guide them to make disposal decisions on both electronic and physical records. Their decisions are then routed to records management and collects approvals for disposal. This task is currently past due. Please complete this task by Wed, Aug 29, 2018. You can approve records to be deleted by Client Matter, or individually. Click on the link below to get started. Approve records for disposal by client matter, or individually. Route project to proper parties and manage the work until closure. Includes: automatic reminders, the proper filing of counterparty documents, tracking spend and time, reporting on performance, calendars for both entities to track deadlines with drilldown. Route projects to proper parties, manage the work until closure. Includes: automatic reminders, the proper filing of counterparty documents into iManage, reporting on performance, calendars for both entities to track deadlines with drill down. Track docket dates and matter information including links to documents. Workflows and checklists to manage most onboarding procedures along with reporting. DocMinder® can create automated recurring processes to track employee compliance and produce evidence to governing bodies. 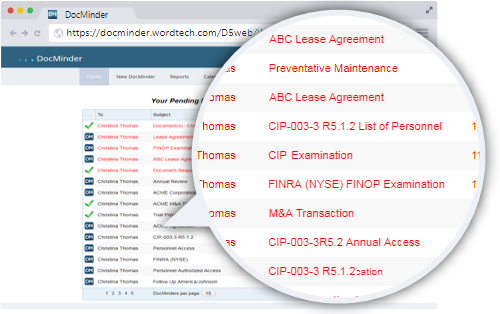 DocMinder® Embedded with DocuSign or Adobe Sign integration to handle end-to-end contract workflow procedures. Automatically kick off the proper process with DocuSign or Adobe Sign integration. Executed documents are automatically filed in the proper file structure. A requestor fills out a HotDocs interview form. That in turn selects the proper contract template and clauses to build the document; files the finished document in iManage and DocMinder® assigns the project. That starts the Mark-Up and Approval process. Then, DocuSign handles the signatures while obligations are managed throughout the life of the contract. Automated processes can be created for the entire contract lifecycle. Initial requests refine reporting capabilities by capturing important meta-data on the front end. After the request, if the markup and approval process is not set in stone approval assignment/reassignment and delegation features make it to fluidly change the approval flow mid process. Once the Contract is ready to be executed the signatures can be collected by a DocuSign process or by collecting hard signatures. After the contract is signed by all parties all critical dates and obligations can be managed throughout the contracts life. During a meeting about an issue, you can quickly create a checklist with task assignments, post meeting automatic follow-up until closure with collection of relevant documents and reporting. Calendar view for oversight of approaching deadlines. Email a survey of relevant parties to confirm if there are conflicting issues and provide reporting for evidence. Individual follow-up until they have submitted their response. (e.g., could be used for most survey applications). Automatic checklists with relevant documents; automatic reminders before and after Board Meeting until closure. Calendars for oversight of deadlines and reporting for evidence. 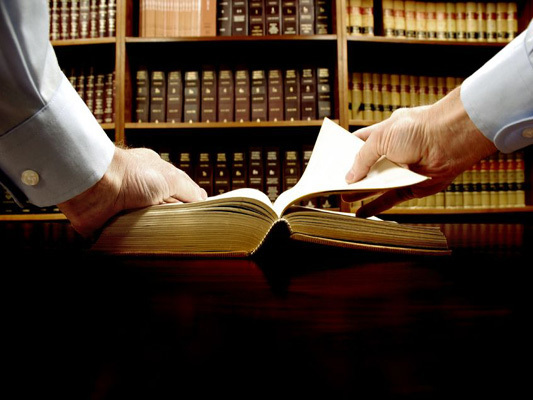 When an attorney searches through documents they will have a guide to the best forms to use. They will see a 1 to 5 star rating, $ investment and comments. At the end of a week they will receive an automatic email notification with a simple rating request form on the documents they used that week. Easy review of comments helps with collaboration. 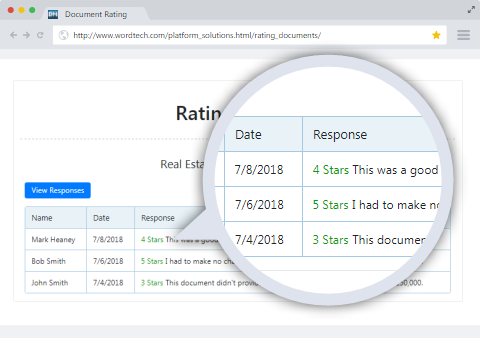 Management has high-level reports to see which are the top form documents; which are providing the best reviews; which are losing value over time; and more. 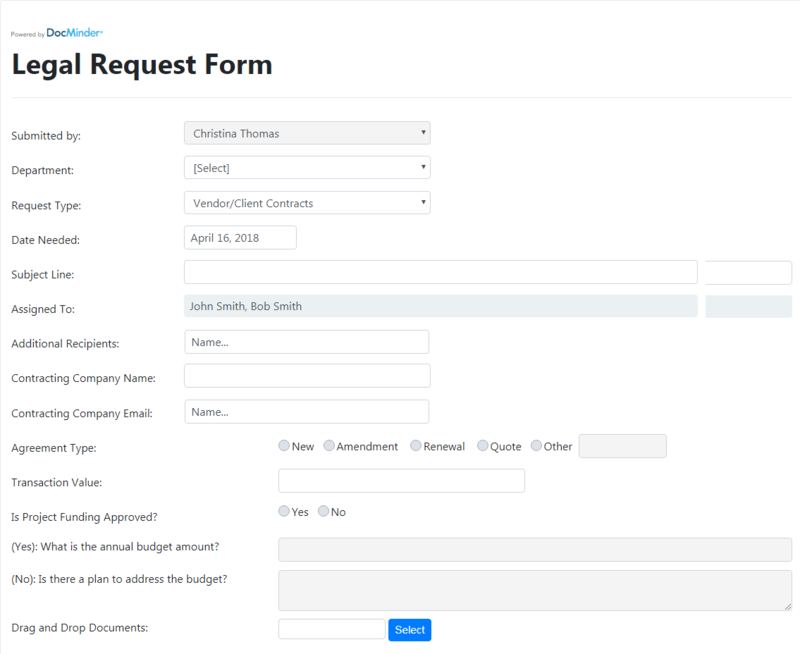 A web form displays with customizable form-fields such as client, matter, etc. As you fill in the form the proper associated workspace and folders are displayed - once the form is submitted, the scanned document is filed correctly in the document management system. You can setup notifications to alert the individuals associated to the workspace where the scanned document was filed. Also, specific workflows can be launched to ensure documents are filed correctly, along with reports and calendars for oversight. 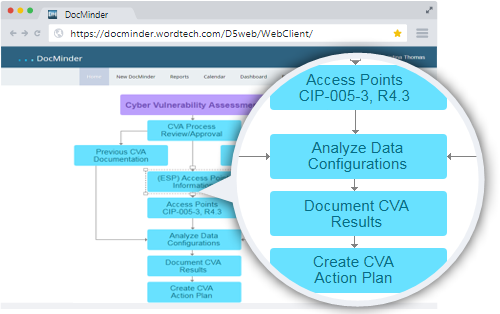 Whether it’s improving performance or automating workflows, DocMinder® has the power to optimize manual time-consuming tasks by transforming them into efficient automated business processes. Reduce administrative costs with DocMinder® - convert manual and paper-based tasks into automated business processes and workflows that create value for your business. DocMinder® helps you collaborate with others, and report on what's been done. Use your homepage to organize your day based on what needs to be done today, later or long-term. Replace manual steps with powerful automation; design automated workflow processes with a visual, drag and drop editor. Create single or multi-tiered workflows with parallel, sequential or split patterns; standardized workflow processes across your organization. Reporting with an easy connection to your team's data- through reporting, visual dashboards and calendars. Create your own reports and template views; generate reports by individual, group, office, etc. 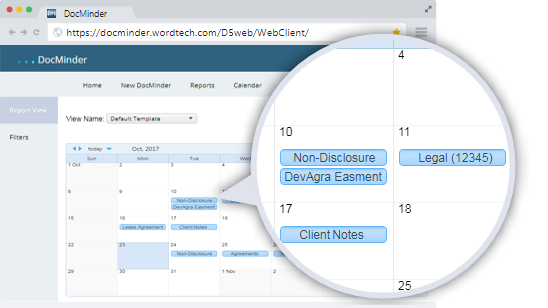 DocMinder® Calendar makes it easy for your team to find the information they need to keep work moving forward. Three different calendar views - day, week and month - make it simple for you to track who's doing what and when. Learn how DocMinder® can help you focus on more value-added activities. © 2019 Word-Tech All Rights Reserved.